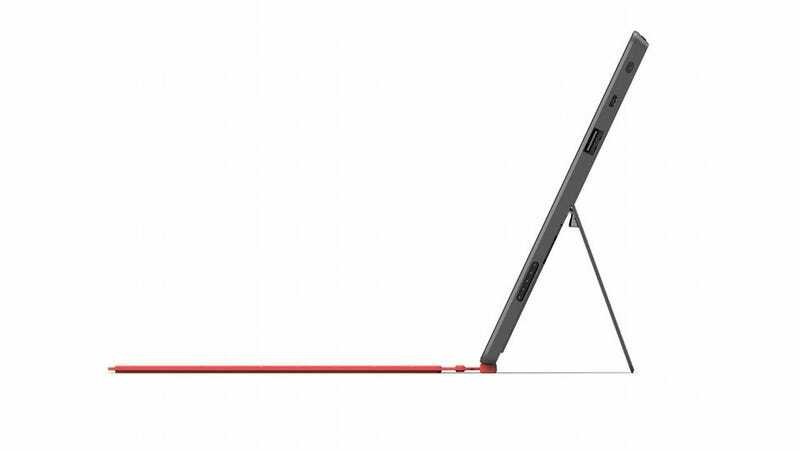 The Microsoft Surface may be billed as a tablet, but hiding in its 3mm cover is a pressure-sensitive keyboard called Type Cover which will allow the tablet to transform resemble more of a computer on the go without the burden of a bulky keyboard case. Type Cover latches onto the Surface tablet with magnets (much like the Apple's Smart Cover does with the iPad), and "senses keystrokes as gestures," and has a touchpad area for cursor manipulation, according to Microsoft. Type Cover also has a built-in accelerometer, so that it knows when it is folded back behind the tablet (thus preventing accidental input). Microsoft says that Type Cover can detect the force you're placing on it down to the gram, and won't input characters when you just have your fingers resting on the keys. And Impressive as this technology may be, it's possible we've seen it before; four years ago, Microsoft showed off a project at its Research Summit called the unMouse Pad, which used force-sensing resistors to create a paper-thin multitouch trackpad that was also pressure sensitive. I used it myself, and it could detect all 10 fingers with great accuracy as a prototype. Seems like it would have been very easy for them to shoehorn that technology into the Type Cover.